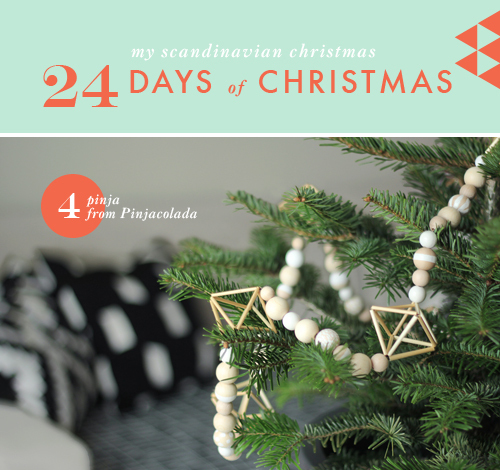 Day 4 of My Scandinavian Christmas is by Pinja of Pinjacolada based out of Helsinki, Finland. Pinja has a wonderful blog showcasing her beautiful photography and fantastic DIYs complete with touches of bright colors and bold patterns. This year I wanted to make a piece of Christmas decoration Inspired by the Finnish traditional Himmeli, which is an ornament made of straw and is hung form the ceiling at Christmas time. I wanted to keep it natural and simple by using the straw and wooden beads that I decorated with a little bit of white paint. The ornament hangs now on our tiny Christmas three but after Christmas it could still stay around somewhere in the house. p.s. This is the video where I learned how to make the Himmeli piece (clear even if you don’t speak Finnish). Thank you so much Pinja for participating in My Scandinavian Christmas! And be sure to check out her wonderful blog. It’s got the best ideas!